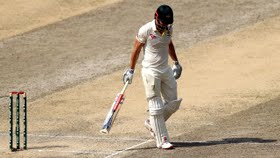 Having staved off defeat in the first Test against Pakistan, Australia crumbled disappointingly in the second Test to concede the series 1-0. Mohammad Abbas was the star of the show for Pakistan with a supreme 10-wicket haul as Pakistan won by 373 runs. Former Aussie skipper Shane Warne was extremely disappointed with the team’s batting effort. Taking to Twitter, he also congratulated Pakistan for their terrific batting effort. “Congrats to Pakistan on a terrific series win, well played - just to good. Australia’s batting was very ordinary in 3 of the 4 innings, and the amount of overs Australia could only manage to last is a real concern as well as the manor of all the dismissals too. Worrying times...” Warne wrote on Twitter. Australian skipper Tim Paine was also unhappy with his team’s performance. "Disappointing to let things slip from the first session on day 1. Our bowlers toiled pretty well on that wicket. It's just our batting. Abbas tested our defence time and time again. Have to go on and improve. No sugarcoating, our batting needs to be addressed,” Paine admitted in the post-match interview. Australia will now face Pakistan in a three-match T20I series starting from October 24.